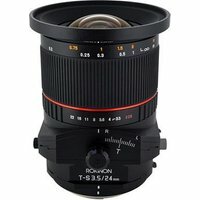 The Samyang T-S 24mm f3.5 ED AS UMC Lens Fujifilm X-Mount Fit is a wide-angle, full-frame, tilt and shift lens with perspective control and tilt-shift functions. Its unique optical and mechanical construction makes it an ideal tool for architecture and landscape photography. The T-S 24mm enables smooth and individual adjustment of the focus plane angle by +/-8.5 and enables parallel shift of the optical axis by +/-12 millimetres. To make the tilt-shift function even more seamless, both the lens mount as well as Tilt-Shift section may be rotated on the optical axis. The tilt-shift section may be rotated left by 90 degrees (with 30 degree adjustment), while mount of the lens may be rotated both in left and right direction by 90 degrees, also with 30 degree adjustment. Optical design of Samyang T-S 24mm 1:3.5 ED AS UMC comprises of sixteen lenses arranged in eleven groups, including two aspherical lenses and two lenses made of ED glass with low dispersion factor.